In this guide we’re going to show you how to watch ITV Hub abroad (formally ITV Player). One quirk of being British or having lived in Britain for a long period of time is we love our British based TV. ITV or “Channel 3” as some of us older watchers fondly call it produces a wealth of excellent TV programs from soaps such as Coronation Street to dramas like Downton Abbey. Many Brits are lucky enough to venture off on holiday, move abroad indefinitely, own a holiday home or have relatives that do which all leads to one question while we are away. 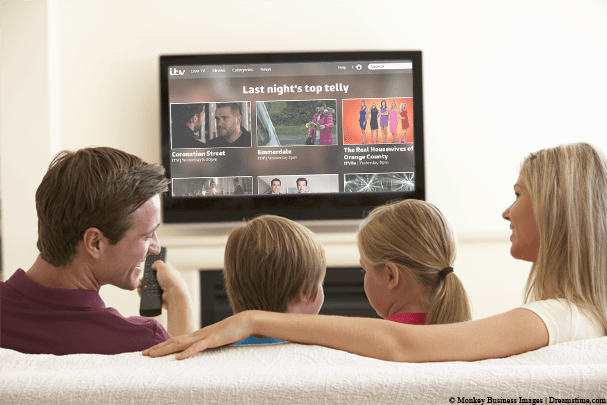 How can I watch ITV Hub abroad? Regardless where you are, be it Spain, France, Germany, USA or anywhere else in the world the simple fact is you can’t directly access ITV Hub in any other country than the UK. So you’re probably wondering how you can watch and if it is even possible? The great news is, it is! For this you’ll need something called a VPN from a provider such as my recommended one, ExpressVPN. A VPN is a system originally used by business to allow travelling workers to securely access their office over the internet. There are plenty of VPN services now available to the public which are multi-functional and a sideline aspect of these is they allow full access to ITV Hub anywhere in the world. A VPN actually sounds more complicated than it is but in a nutshell it allows you to connect securely to another location in the world and assume the identity of that location. Where can I get a VPN for ITV Hub? A reputable VPN provider will set you back around £4 – £6 per month (approx US$6 – $10) or less if you sign up for a year and will allow you to do much more than just watch ITV Hub but for now we won’t confuse you. One provider we highly recommend is ExpressVPN due to the simplicity of their software to connect. Another plus in our recent review we found them to offer a top notch service, just click on their name to visit their site. There are other good providers that are worth considering such as IPVanish and NordVPN who also offer simple software too. So feel free to visit their site by following our links below. If you know a little more about what you’re doing then there is a huge range of other providers who can be compared in our VPN Comparison Guide. With our above solution you can bypass the restrictions and watch from anywhere in the world. Once you’ve signed up just download the VPN software from their website or their app from your usual app store. Press Choose Location (1.) and then press United Kingdom (2.). Once connected just visit the ITV Hub website or launch the ITV app. You’ll need to enter a UK postcode on the ITV Hub website once connected but you can use any. A quick search of Google will be enough but a few you can try are TN23 3FN, W14 8EG or OX10 6SE. See how easy it is to connect in our example video below. Why is ITV Hub even blocked in the first place? I am sure many of you have attempted to access before reading this article and been frustrated to have been met with a notice like the one below. One of the strangest things about this is there really is no need for ITV Hub to be blocked outside of the UK. After all ITV are a TV channel paid for by advertisement and unlike the BBC even for those of us who spend most of our time in the UK there is no licence fee to be paid. Granted, advertisers more than likely pay for adverts to be shown to UK citizens but the honest reality is even if we’re on holiday or have moved away permanently we’re still interested in British products when we can get hold of them. The reason that you can’t access it is because the website knows you’re not currently in the UK. Each internet connection is given a unique address called an IP address, kind of like a phone number so when you visit a website it knows to send you the information and not someone else. From this IP address the sites you visit can tell your physical country location. A VPN allows you to change this address which is what allows you to watch ITV Hub abroad. So there you have it, you can now watch ITV Hub in Spain, in France, the USA, Australia or wherever you are in the world. If you have any questions at all please feel free to post in the comments and I’ll be happy to answer them. Hi.Sorry but I’ve been trying to watch your video”how easy to set up VPN.” It insists that I’m calling from abroad,I am not,just want to purchase to take with me abroad. Please advise.Thankyou. Hi, thanks for your comments. Sorry I’m not sure what you mean by “it insists that I’m calling from abroad”. Are you trying to purchase one of the services? If so which one. Will this allow me to install and watch the ITV player on my Roku too, or should I just stick to PC with Chromecast? I’m not massively familiar with the Roku box so I’ve just checked out its specs. It appears you can’t connect directly to a VPN service via the Roku box so if you wanted direct connection you’d need to buy a VPN capable router. The cheaper option would be to use it on your PC. Trying to watch the world cup on ITV Player. The site is requesting a postal code to verify location. Tried several but none worked.Any ideas?. Any will do Mick, try CR0 3RL or CR0 0AB. Are you getting a certain error message? I get the STV version of the same message when I try there. My “location” via VPN is near Crawley, which looks like it should be covered by ITV. Any ideas? Hi Emily, did you enter a Scottish post code? Open a new browser either in Incognito mode if using Google Chrome or InPrivate mode if using Internet Explorer, then head over to ITV Player. Try entering a post code like M8 9TZ. If that doesn’t work connect to a Canadian server on your VPN service and you can watch all the games at http://www.cbc.ca/sports-content/soccer/brazil2014/ – It’s slightly better quality than ITV too and it should be slightly faster for you being closer to the US. Do you use the free version of Hotspot Shield or the paid version? I’d recommend signing up for a trial at VyprVPN (http://www.vpncompare.co.uk/vyprvpn-com) and testing ITV Player through them. You get 3 days before being charged so just remember to cancel it if it doesn’t work or you don’t wish to keep it. Once we’ve established if it works with them we can see if the issue is specific to Hotspot Shield or something else. Keep us posted, hopefully we can get this resolved for you! I use the pay VPN service Overplay to watch bbc and itv player from Germany, and have never had any problems. However, for some reason I am now unable to play the children’s channel (citv) on the itv player. All other channels work fine except for citv (the one we need most!). When we click on an episode to watch, a black screen just comes up. Any idea why this could be? (I’m using a desktop pc, not a mobile device.) Also, I hesitate to contact itv help/support directly, as I assume they will be reluctant to help because I’m abroad. What do you think? Sounds like a computer/browser issue. If you’re using internet explorer try Tools > Safety > InPrivate Browsing. Please report back if that works or not. Thanks for your reply. You’re right – it was a browser issue. I had been using Firefox, but as soon as I used Chrome everything worked perfectly! I’m not familiar with Media Hint. Although looking at their website it appears to be a browser add-on? Perhaps this is causing the issue. I’d suggest you contact them directly to see what they say. Other than that using a dedicated VPN provider might be a better solution as I can confirm those work fine with ITV Player. Thank you. I’ll try a VPN. I will be in Turkey when Wales play Australia in the Rugby World Cup does any one know how can watch the match on my IPad ? Hi Derrick, This guide shows you how you can watch ITV online. It’ll work in Turkey and with your iPad, just download the ITV Player to your iPad before you leave and sign up for one of the VPN providers listed in the article. What VPN providers have you tried? The service is tested and working with the ones in this article. I have O**** VPN installed on my iPad mini, I am able to watch BBC i player no problem, however it will not allow me to watch ITV, how is this possible and what do I need to do to correct this problem. I am in Spain. I’ve just double checked. I connected to lon-a06.ipvanish and used the postcode you used and it worked fine. Chances are if you’re previously visited ITV Player outside the UK it’s stored a cookie and remembers you. Try again in Incognito or Inprivate mode on your web browser. If that works clear out your full history, cache and cookies from your web browser and it should work on your standard browser. Hello, I purchased IPVanish and it works for both ITV Player and BBC Player on my Windows computer. It also works for BBC Player on my iPhone. However, it isn’t working for ITV Player on my iPhone. When I try to access a show (Endeavor) I receive an error message that says Safari cannot open the link because the address is invalid. Any thoughts would be much appreciated. Thank you. Is it just that one specific show that doesn’t work, how about others? Thank for the quick response. Same message for other shows on my iPhone as well. I should mention that I can watch Endeavor on my Windows computer with no issues. I can also watch Sherlock on BBC Player on my iPhone with no issues. I’m not entirely sure what the issue is. One thing you could try is, put your iPhone into airplane mode and then re-enable Wi-Fi. Then try and view ITV Player on your iPhone. Thanks. I tried that and I rebooted. Same error message about the link being invalid in Safari. Could it be a browser setting? I couldn’t say unfortunately. Are you using the ITV Player app? If not are you’re accessing via Safari browser, do you know if it even works in the UK using that method? I don’t have an iOS device to test this. Thanks. I cannot get the ITV Player app from the App Store. I don’t have a UK App Store account. I live in Chicago. I use Safari and choose “play in app” which actually plays in the browser. (The other option is get app.) The odd thing is that I don’t have this issue with BBC Player in IOS. Have you ever tried that method of playing directly in the UK? It could be that it’s just an issue playing with Safari on iOS rather than anything to do with the VPN itself. If you don’t have an Apple music account you can change your Apple store region settings in your account area and then download the ITV Player app. You can of course change back after you’ve installed it – might be worth a try. Hello I am thinking of ordering this service for my husband. He travels to Germany weekly. Will the payment be in Dollars or sterling? The payment will be in dollars. So roughly between about £4-£7 depending on the length of time you sign-up for. With probably 10-30p on top if your bank charges you for paying in a foreign currency. Just downloaded the IPVanish VPN and both itv player and Sky go won’t work. The error message on itv says ‘we’re sorry something went wrong – please try again ref 40320’ and the error message on sky go says ‘this video is not available in your territory’. I’m in Greece. It should be working no? I’ve just tested ITV Player and it works with their Manchester servers. A selection of London servers aren’t working so try Manchester, Liverpool, Glasgow or a few other servers. I don’t have access to Sky Go at the moment but there hasn’t been any other reports, again, try one of the other locations and let us know. Unfortunately I don’t have the answer to that, sorry 🙁 Maybe someone else has the answer? A good VPN service will allow you to stream both iPlayer and ITV without buffering. We recommend you take a look at some of the recommended providers in the article, they offer a money back guarantee. Hi, I can get iTV to work on my home PC 100% through my VPN but for some reason it wont play on my phone or tablet. any idea as to why and how to fix it please? You can try turning off “Location Services” and “GPS”. Then try again. If that doesn’t work put your phone or tablet into “Airplane Mode”, turn on WiFi and then try again. I see that you are using tablets or laptops, can I use a smart tv?? It depends on the features of the Smart TV. For example you can use Overplay, visit their website (https://www.vpncompare.co.uk/overplay-net) and click Setup – SmartDNS Setup then scroll down and you can find guides for SmartTVs. It’s possible ITV Player restricts streaming over a cable connection from the iPad to the TV. Have you tried with some of the other UK services such as iPlayer, CH4 or CH5 to see if they have the same issue from iPad to TV? I can get BBC i player no problem and could get ITV via Hub last year. Seems it’s no longer possible to use ITV Player on an iPad and use a HDMI cable both inside and outside the UK. Thanks anyway. Will stop trying! I hope you can help before I go completely insane, I have been using Nordvpn quite happily to watch abc, channel 4 and ITV.com from Australia. It seems ITV have blocked the VPN. 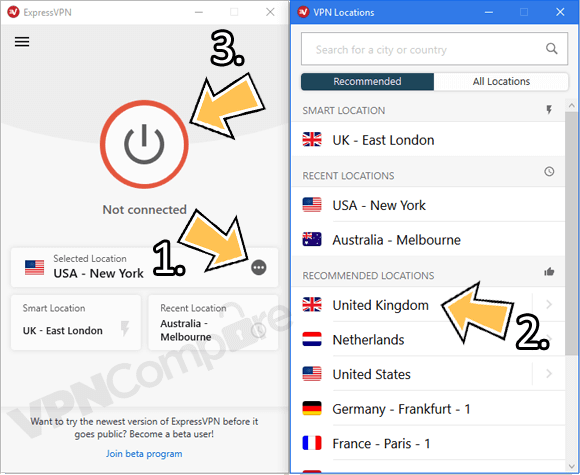 For now you should use the ‘Double VPN’ option on NordVPN and select Netherlands->UK. It works fine.